As there is only a week to go before Carfest South, we have decided to take a moment to showcase the amazing and retro Airstream trailers. These beautiful, silver bullet trailers allow customers total autonomy over their stay - with toilets and showers included within the van, it’s luxuriously comfortable and a total showstopper of a way to spend your time at Hotel Bell Tent. The Airstream trailers are available at both Carfest events, and Silverstone Woodlands F1. The company, Airstream Facilities, has the biggest fleet of Airstreams outside of the U.S. We sat down and asked them a couple questions ahead of Carfest South so that you could get acquainted with the company, and the beautiful fleet they have to offer. How did the company come about and grow? The business is run by husband and wife Mojo and Kizzy Fell. They saw a gap in the glamping market for luxury Airstreams and started importing them from the US to the UK. The Airstreams soon became very popular, selling out every year at Glastonbury and for the past two years at Port Eliot and WOMAD. 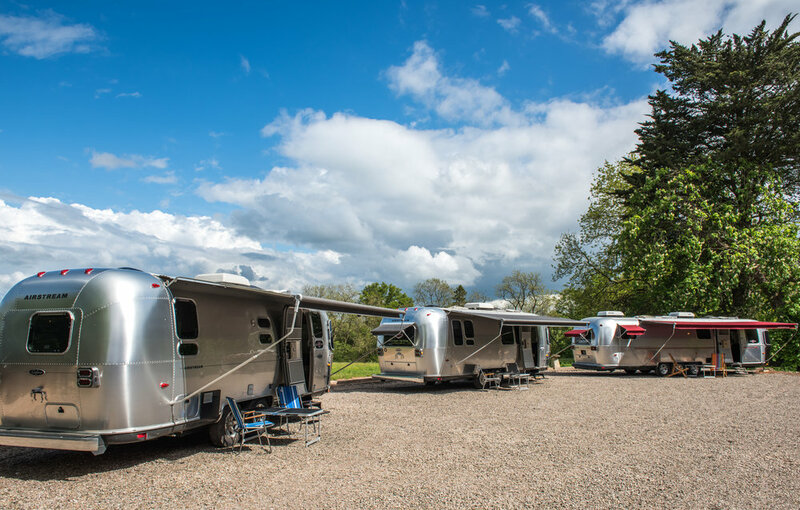 All our Airstreams are imported from the US and lovingly restored and refitted in our warehouse in Herefordshire, using local professional craftsman. Any other information you’d like to share about Airstream Facilities? We are Europe's largest Airstream hire company with a fleet of over 37 accommodation Airstreams, an Airstream Production Office and Airstream Box Office/Bar. We supply to the film/TV industries, festivals, events and privately. We have a selection of 2-5 berth accommodation Airstreams with either modern or original style interiors. Our most popular Airstreams are our CCDs, designed by esteemed architect and interior designer Christopher Charles Deam (CCD). San Francisco based designer, Christopher designed a line of trailers for Airstream, these include the CCD international, International Signature Series, and Airstream Sterling. These beautiful trailers are bound to make any stay with us at Hotel Bell Tent a momentous occasion to remember. For more information, check out the link to the accommodation page of our website (click here), or check out Airstream Facilities website (click here).